San Mateo, CA: Music lovers will be “Lost in Love” when Air Supply takes the stage this summer at the San Mateo County Fair. Air Supply, a rock duo with world-renowned fame, will perform on June 9, opening weekend of the 2019 San Mateo County Fair. All main stage concert general admission seating is free with fair admission, on an open seating, space-available basis. For reserved seating, the fair’s Gold Circle admission includes fair admission plus reserved prime seating in Fiesta Hall (main stage). Gold Circle tickets are just $40 in advance. Gold Circle, discount admission and discount carnival wristbands are on sale now at sanmateocountyfair.com. Air Supply consists of English singer-songwriter and guitarist Graham Russell and Australian lead vocalist Russell Hitchcock. The duo plays about 130 live concerts a year and performed their 5,000th show last September in Las Vegas. Founded in the 1970s, Air Supply had a succession of hits worldwide. In the early 1980s the group had eight Top Ten hits in the United States. Their hit “Lost in Love” became the fastest selling single in the world. Their second single “All Out of Love” went up the charts even quicker. Seven top-five singles later, Air Supply (at that time) equaled The Beatles’ run of consecutive top five singles. The albums Lost in Love, The One That You Love, Now & Forever and The Greatest Hits sold in excess of 20 million copies. “Lost in Love” was named Song of the Year in 1980, and with the other singles, sold more than 10 million copies. 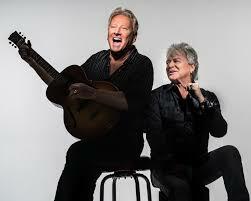 In May 2010, Air Supply’s long-awaited album, “Mumbo Jumbo” was released. One of the album’s single “Dance with Me,” earned Air Supply a prominent feature article in Billboard Magazine titled “Still Supplying the Hits After 35 Years.” Composer and vocalist Graham Russell was honored with a BMI Million-Air Certificate recognizing 3 million performances of the duo’s hit “All Out of Love.” In 2013, the duo was inducted into the Australian Recording Industry Association’s Hall of Fame. In addition to Air Supply, the 2019 concert series announced to date includes Morris Day & The Time (June 8); Queen Nation – A Tribute to the Music of Queen (June 10); and Petty & The Heartshakers – A Tom Petty Tribute Band (June 11); Sir Mix-a-Lot (June 12); Better Than Ezra (June 13) and The Commodores (June 14). The award-winning San Mateo County Fair is the Peninsula’s premier community event for family fun and entertainment. The San Mateo County Fair strives to provide a diverse experience through education, inspiration and entertainment. The annual fair represents a celebration of our community’s talent, interests, innovations and rich agricultural and artistic heritage. The theme of the 2019 Fair is “Celebrating the Best of the Bay” and runs June 8 through June 16. Visit sanmateocountyfair.com for regular updates, contest entry, ticket giveaways and promotions. #SMCF2019.